A brown mouse lemur in the wild. Mouse lemurs, weighing a mere 30 to 80 grams, are the world's smallest primates. Photos, above and below, by Jukka Jernvall. Mouse lemurs can live at least eight years in the wild – twice as long as some previous estimates, a long-term longitudinal study finds. 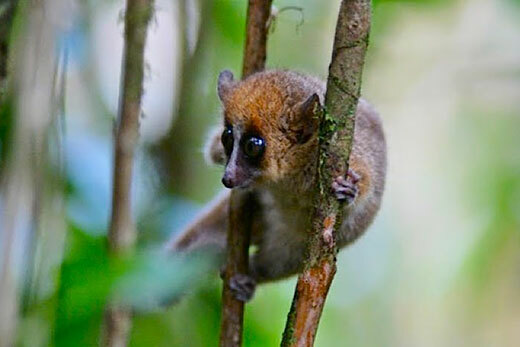 PLOS ONE published the research on brown mouse lemurs (Microcebus rufus) led in Madagascar by biologist Sarah Zohdy, a post-doctoral fellow in Emory's Department of Environmental Sciences and the Rollins School of Public Health. Zohdy conducted the research while she was a doctoral student at the University of Helsinki.